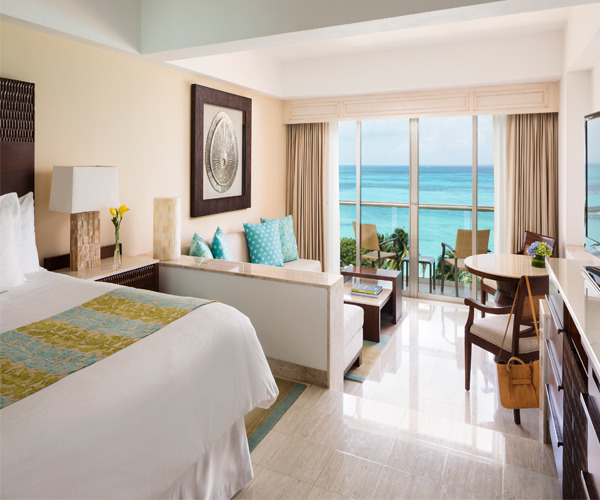 Located on Cancun’s most secluded stretch of white-sand beach, Fiesta Americana Grand Coral Beach Cancun Resort and Spa offers 602 all-suite oceanfront accommodations, each with a private terrace facing the turquoise waters of the Caribbean and lagoon-like pool. The resort’s top two floors are dedicated to the Grand Club, which provides lavish services and amenities both pool and beachside, as well as a dedicated lounge and 24-hour concierge service. The 40,000-square-foot, sleekly designed Coral Beach Gem Spa offers innovative treatments inspired by gemstone therapy and a dramatic 10-step Hydrotherapy Ritual. Guests can choose from a variety of dining outlets, including the AAA Five-Diamond Le Basilic serving French-Mediterranean cuisine, and La Joya, an authentic Mexican experience replete with a tequila lounge. A perfect blend of serenity and activity, the resort is steps from Cancun’s vibrant nightlife, entertainment, and luxury shopping, along with a high-speed ferry to colorful and picturesque Isla Mujeres. This award-winning resort is a member of Preferred Hotels & Resorts. Coral Beach Gem Spa is a 43,000-square-foot complex superbly designed in rich woods, Italian-mosaic décor, sand marble, and a curvy ceiling reminiscent of cascading ocean waves. 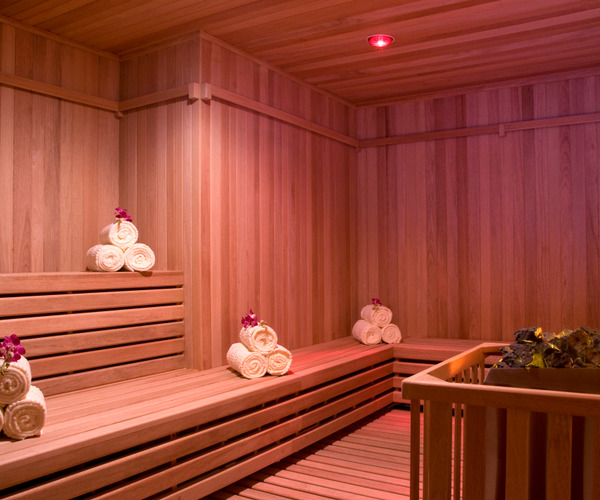 Treatment rooms total 26, and include two shiatsu and Thai massage rooms, a VIP couples suite with dual Jacuzzi and steam room, and two master suites with hydro-massage tubs and colour therapy. Romantics can unwind with a starlit massage in the spa's thatched-roof beach cabana. Complimentary with all spa services is the spa's 10-step hydrotherapy circuit, comprising coed and separate men's and women's facilities such as a colour therapy steam room, dry sauna, ice room, sensory showers, clay steam room, whirlpool, sensory pebble walkway, and pool with water bubble beds, neck jets and floor geysers. The menu lists treatments inspired by both land and sea, along with gemstone therapies like the signature Seventh Wonder Luxury Massage; the 80-minute ritual utilizes seven colours of quartz, aromatic oils, and candles for each chakra. The spa is appropriate for guests ages 16 and older; those younger than 16 are invited to a special treatment room in the salon for Barbie mani/pedis and tutti-frutti or chocolate facials. Top resort activities include sunbathing on the private stretch of white-sand beachfront and splashing in the azure surf, or refreshing with a swim in the oversized pool, which runs the length of the hotel. Guests who want an active vacation can scuba dive, snorkel, fish, or enjoy glass bottom or banana boat rides. Golf and shopping, within minutes of the resort, also are popular pastimes. The resort's fitness centre, located on the third floor, features Life Fitness equipment, steam and sauna facilities, and ocean views; personal training is offered, as are Pilates and yoga (upon request). Vacationing families can take advantage of the complimentary Fiesta Kids Club, for guests ages four through 12 years. For those travelling for work, there is a business centre open seven days a week. All guest accommodations are contemporary-style suites appointed with sitting rooms, satellite TV, nightly turndown and 24-hour room services. All 602 suites offer breathtaking ocean views, and many feature glass balconies. Grand Club accommodations provide guests with admittance to the penthouse lounge for continental breakfast, hors d'oeuvres, and cocktails; spa suites are conveniently located adjacent to the Coral Beach Gem Spa and have unlimited access to its hydrotherapy facilities. The two-bedroom Presidential Suites, the most luxurious of lodging, have full kitchens, two terraces, marble bathrooms with steam baths and Jacuzzis, as well as spacious dining, entertainment, and living areas. There are a total of five restaurants on the premises, in addition to four bars. Fine dining can be enjoyed at the AAA Five Diamond-awarded Le Basilic restaurant, which highlights French Mediterranean fare, accompanied by an extensive menu of international and Mexican wines. More casual venues include the beachside Isla Contoy, offering fresh seafood lunches and á la carte dinners, and the European-style Coral Café, serving light options daily. Guests can begin their day at Viña del Mar for a champagne buffet or á la carte breakfast overlooking the sea, and end the evening at La Joya for gourmet Mexican entrées and live entertainment.